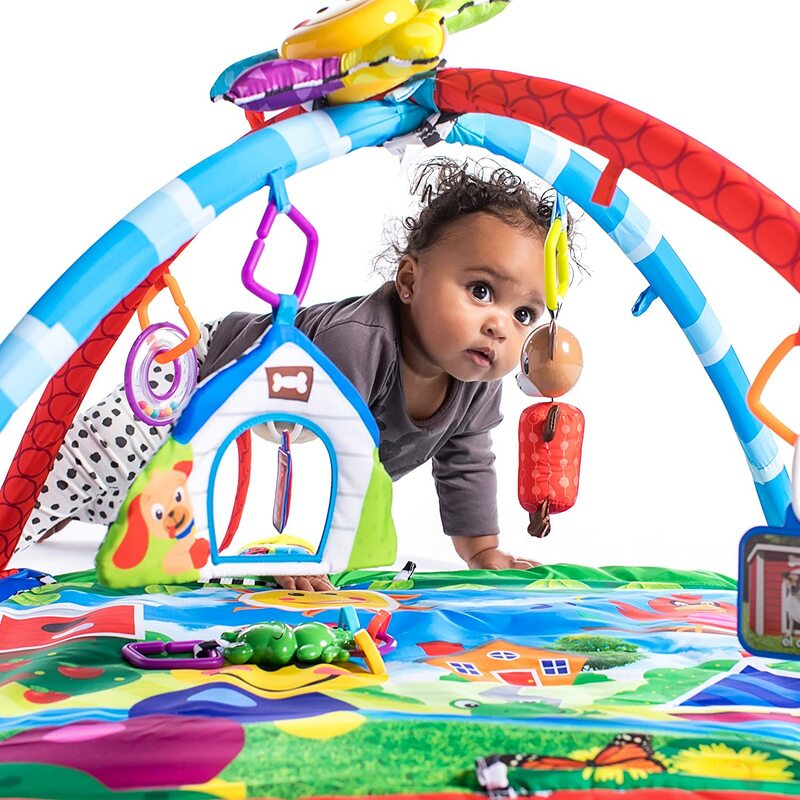 Discovery begins with the Baby Einstein Caterpillar and Friends Play Gym. From day one, your baby is eager to explore their new world and unlock the potential of what their body can do. 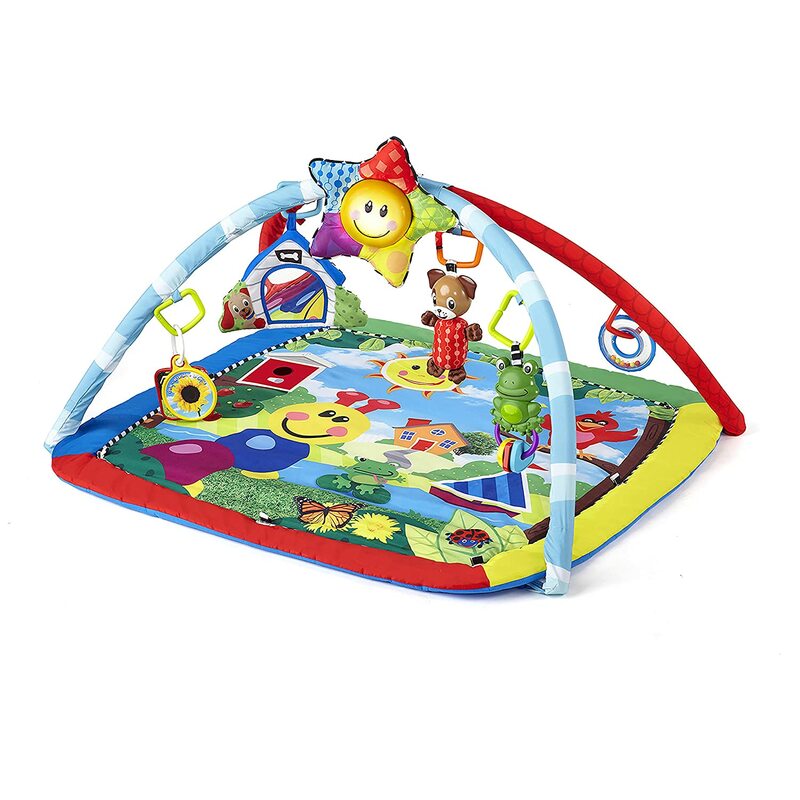 This baby gym provides endless exploration from a large, soft play mat with cheerful characters. 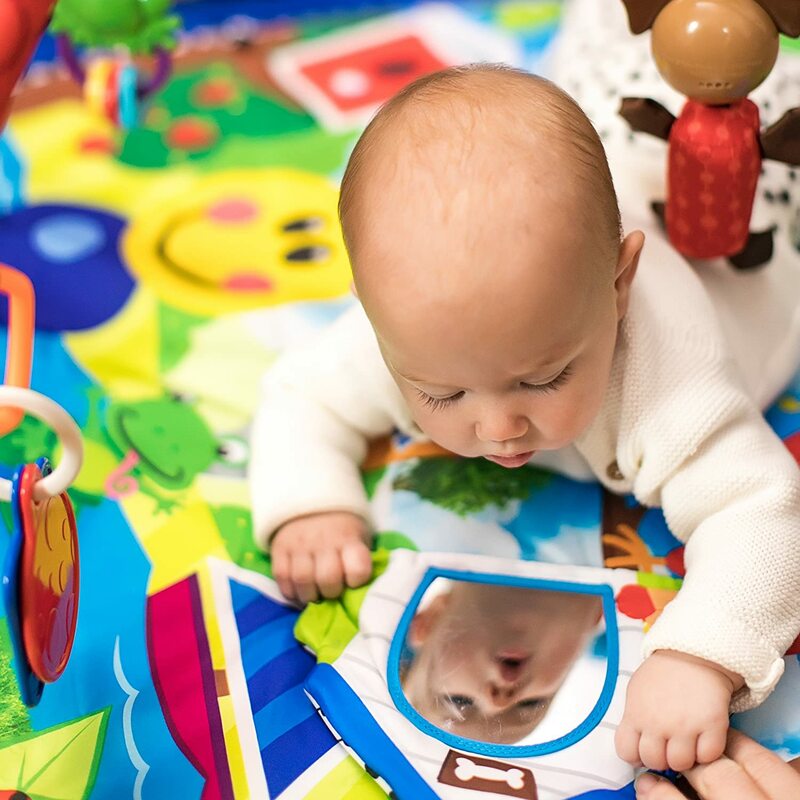 Baby can discover new things to touch, see and hear every day, from exploring their reflection in the baby-safe mirror to kicking the soft toy bar and watching their favorite toys dance. 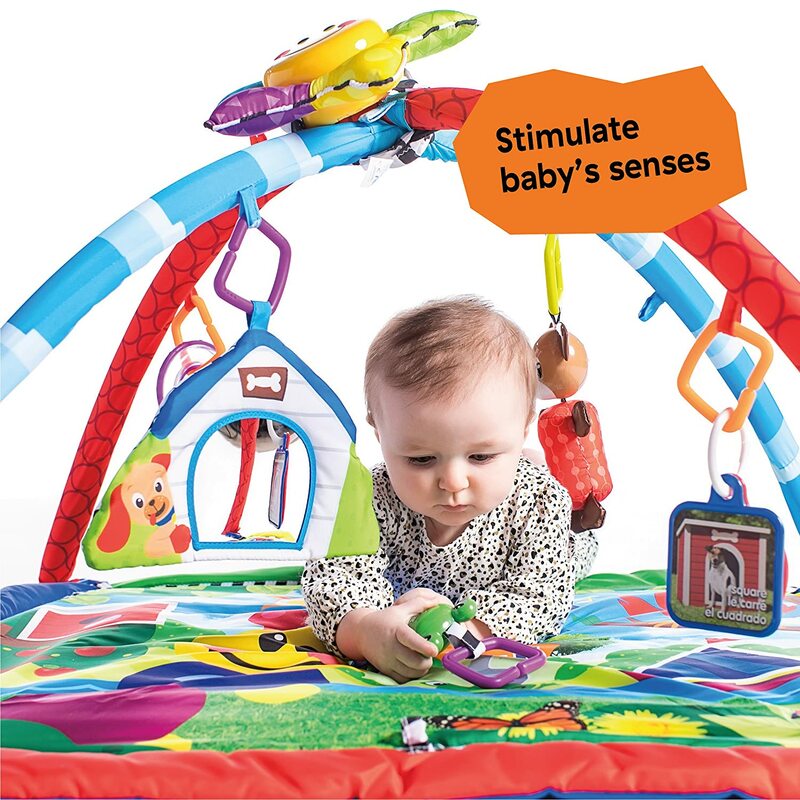 This Baby Einstein gym is full of multi-sensory activity that supports your baby’s development from their back or tummy. 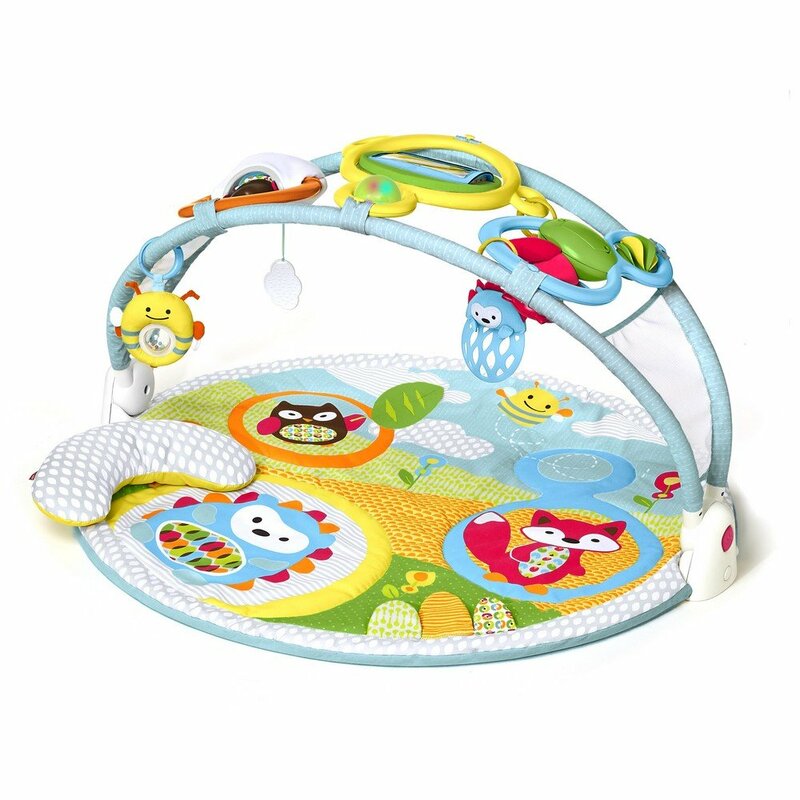 In the center of the baby gym and play mat, a happy star lights up to the rhythm of classical melodies to keep baby entertained. 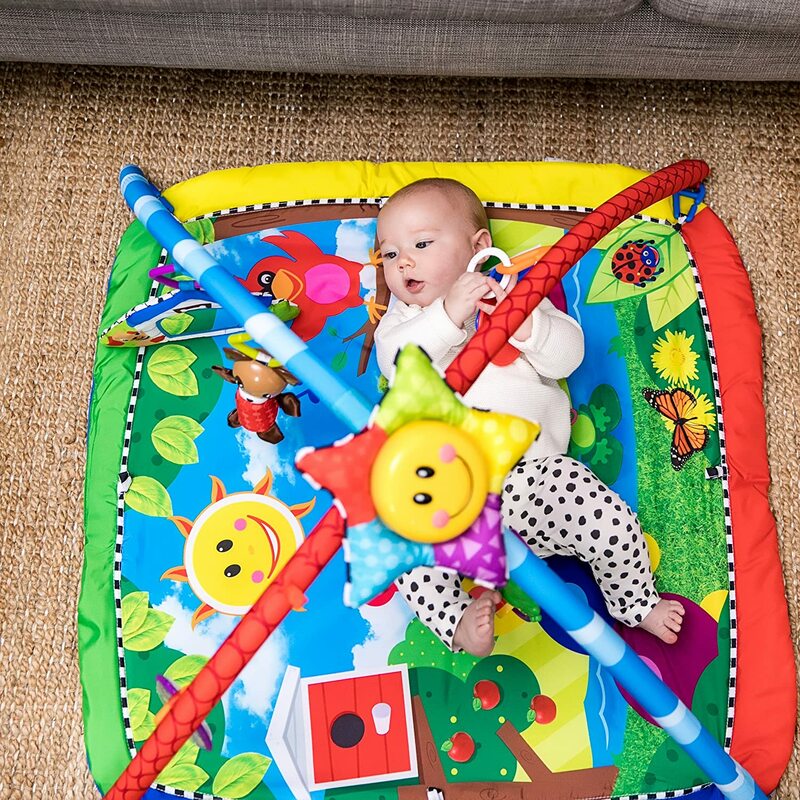 When used as a tummy time mat, you can move hanging toys to the mat for captivating play during this important position. 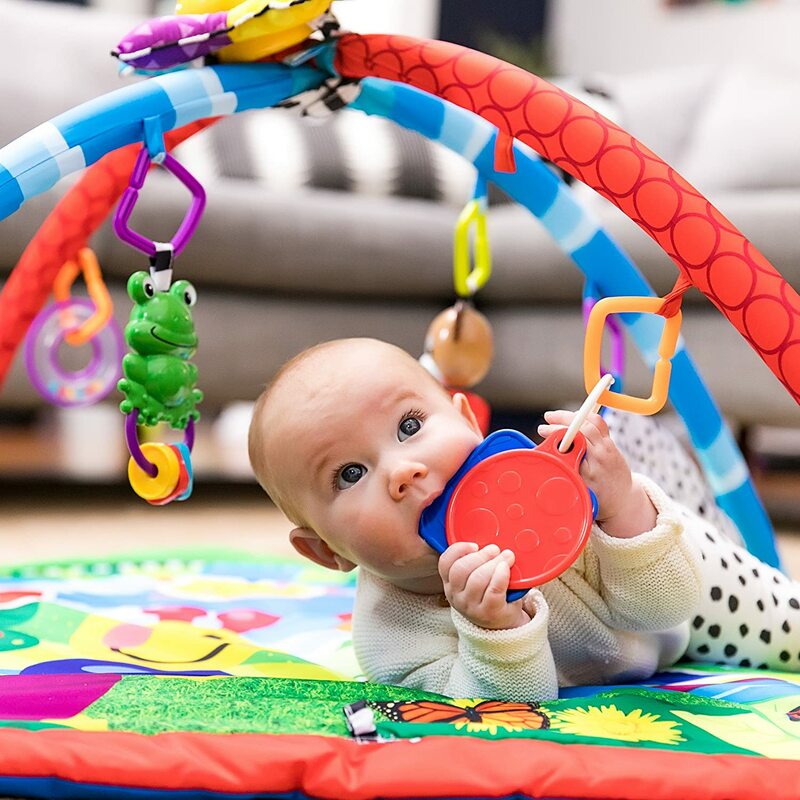 The lightweight design is easy to move around the house, and detachable toys – including the beloved musical star – can travel with baby wherever they go. My clingy (cuddly, sweet) one month old LOVES this. I've only had it a few days, but so far it's bought me back some freedom. Normally I can't even set her down long enough to go to the bathroom without hysterical tears. This morning I got to sit next to her peacefully folding laundry while she entertained herself kicking and reaching for toys. 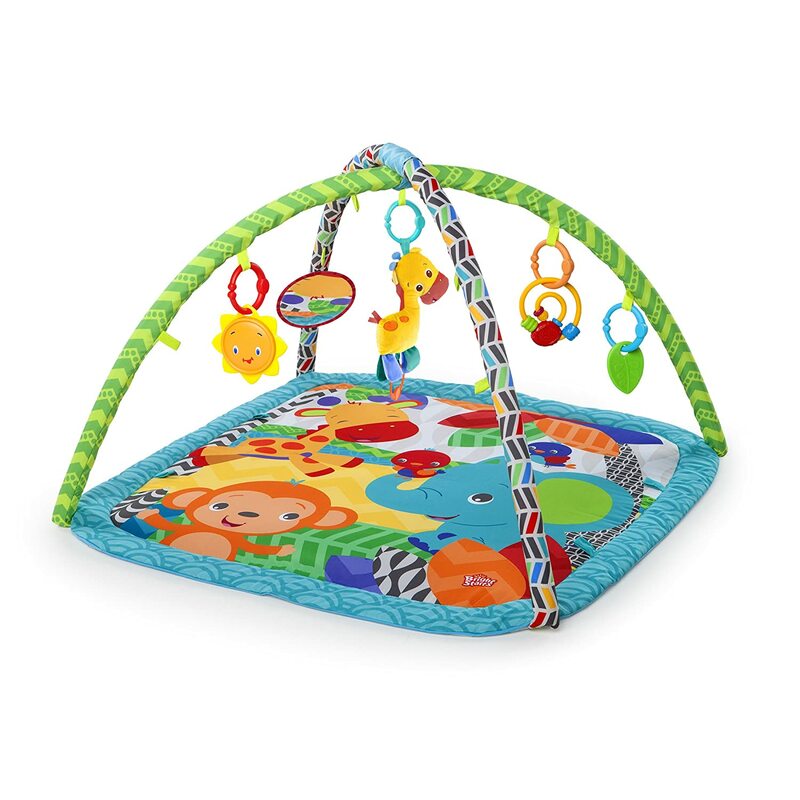 I searched quite a bit before picking a play gym, this was the most brightly colored inviting one I could find that also had a soft cushy mat (why are so many baby toys muted colors? Infants can't see them yet!!). One of the best purchases I made--I bought this when my twins were 3 months old, they're now over a year and still playing with the toys. When they were younger and used it as a gym, they loved it (especially the puppy, mirror, and the donut rattle toy. The music in the sun was a little jarring to me at first, but it mesmerized them immediately. Now that they're older, they still love the mat and all of the toys (all separated from the gym). I had thought, once they didn't need to play on their backs or do tummy time that I'd be done with the whole thing, but, I was really happy to find out that they still love the toys (the frog and the mirror are big hits now, but they still play with all of the toys now--making it really a great purchase (it and other gyms were so expensive that I wasn't sure about purchasing them, but now, after all this time, I realize it was such a great choice). 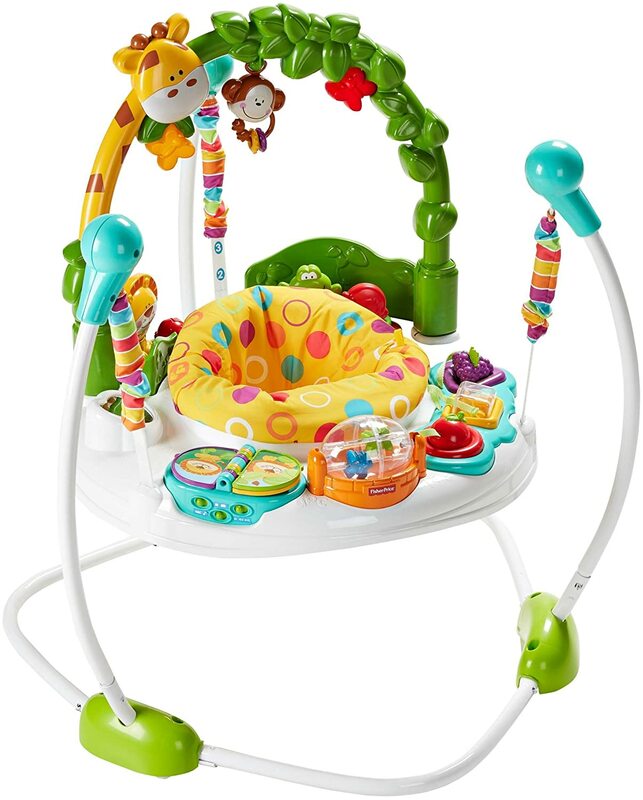 I also purchased the Bright Starts Safari Activity Gym and the Tiny Love Sunny Day gym, my kids still play with all of the toys, but as far as the hanging toys go, the Baby Einstein ones are their favorites overall, and there are more of them than the Bright Starts gym and are much more interesting than the Tiny Love Gym (I'd still buy all three--kept the variety going, but if I could only choose one, it'd be this one--though the musical tiger in the Bright Starts one is even more mesmerizing to the kids than the Baby Einstein sun). If you're on the fence about this gym, I'd say get it, I've gotten much more mileage out of it than I ever thought, and my twins are showing no signs of getting bored with the toys a year later. My son loves this. 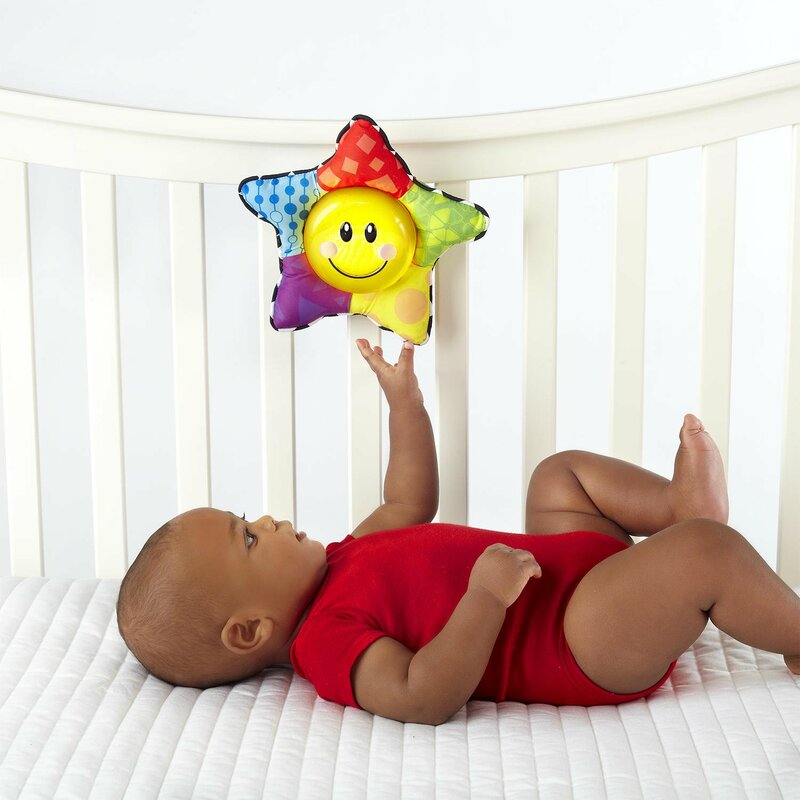 He just stared at it at first because it's so colorful, and he loves the light-up star. It got him to start playing with toys and reaching for and grabbing things. 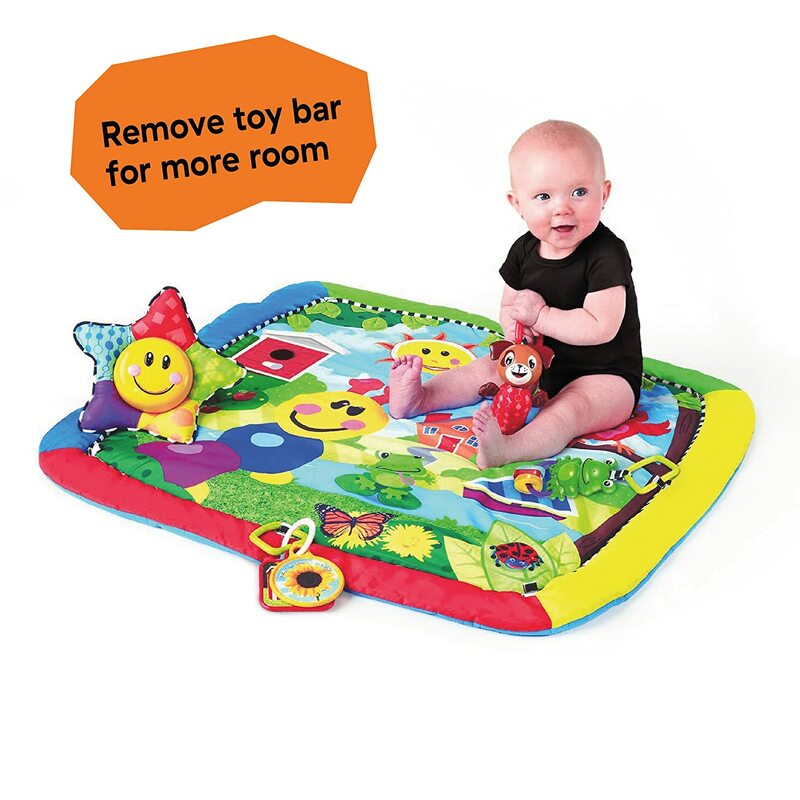 We also use it for tummy time, and I take some of the toys with us when we go out. My only complaint is that it almost hurt my son when I was unpacking it. I didn't realize that the arches were in the box under tension, and when I cut one loose it sprang open. It would have hit my little two-month-old son pretty hard if I had cut it on the other side instead. 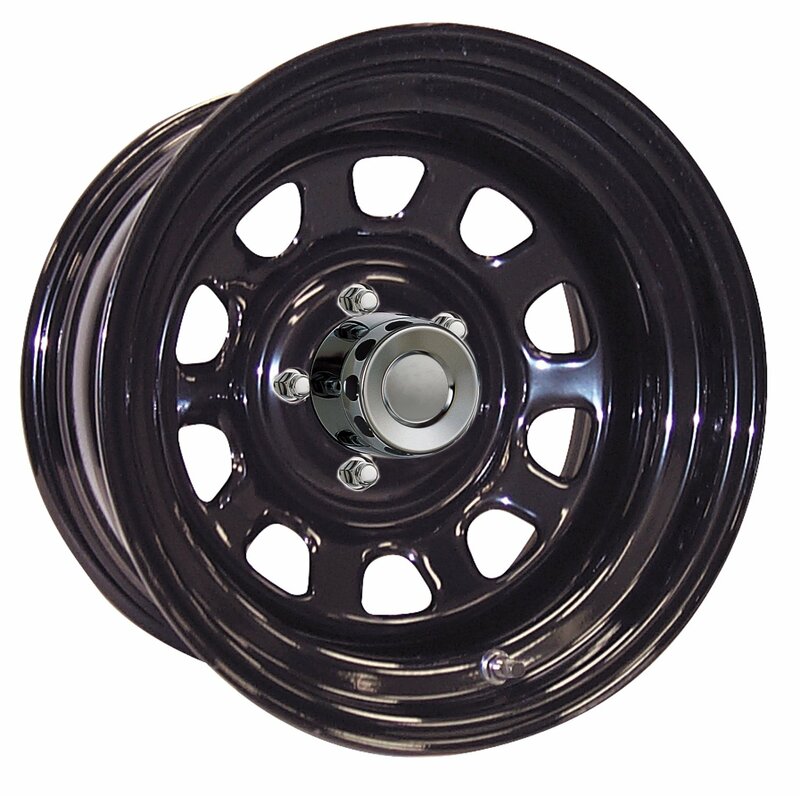 I think it might have said something about this in the instruction manual, but there should be a note right on top when you open the box. 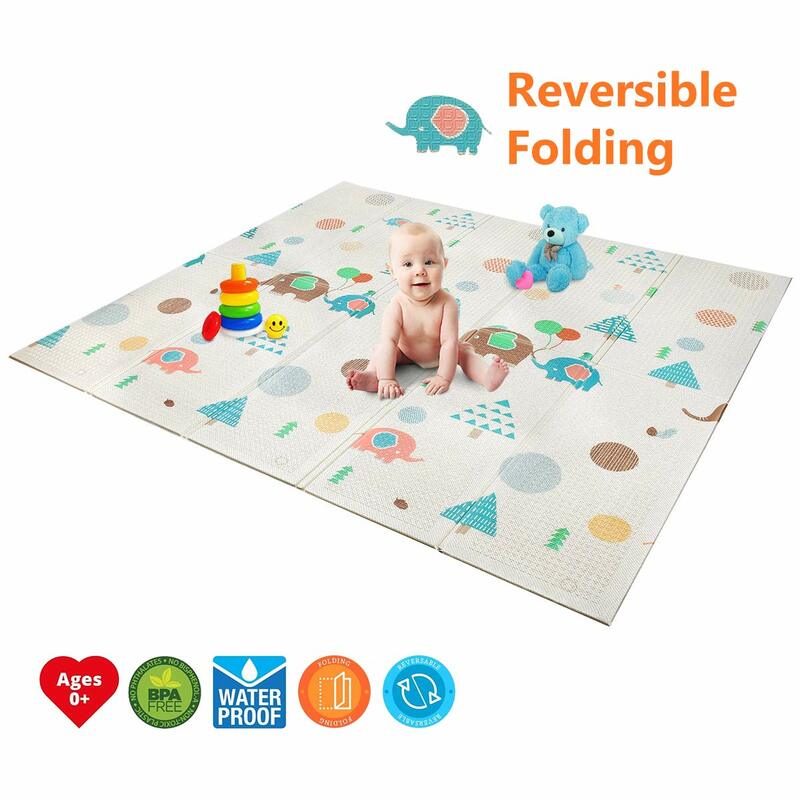 This is really cute and my baby granddaughter is intrigued with all the hanging items.She'll lay on her back and grab for them and then flip herself over and check out the pictures on the mat. It keeps her busy for quite a while and helps her with her dexterity. I watch my granddaughter 3+ times a week and purchased this for her. She loves the objects hanging as well as the items below. She's only 5 months and enjoys trying to grab the objects. It is very well colored to keep her attention and wipes pretty clean because she drools quite a bit. I appreciate that she's not bored when she interacts each time. Nice concept of a play mat but it needs to be improved. 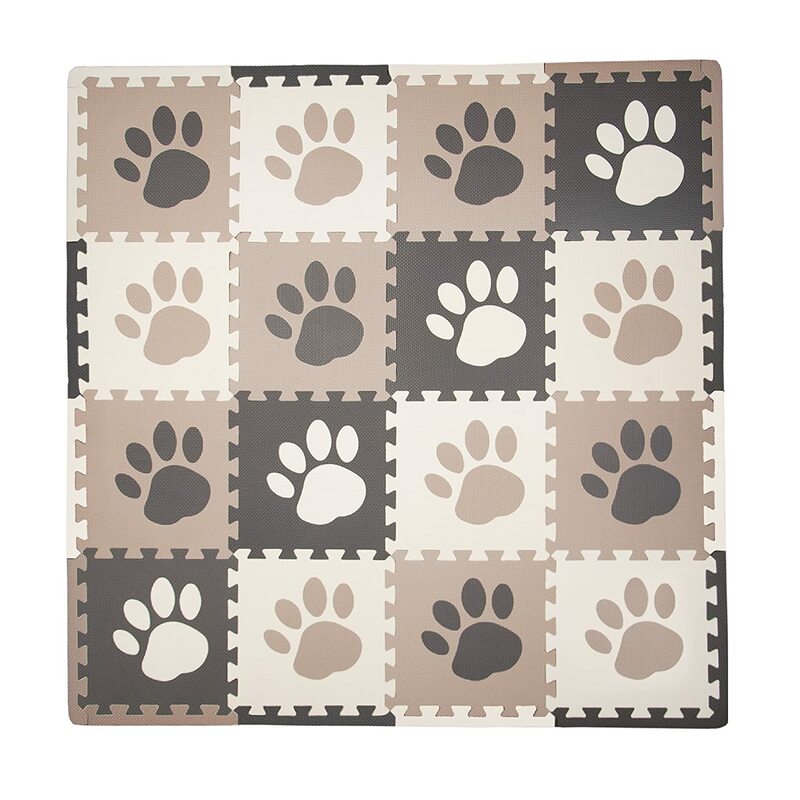 The mat itself is thin and therefore hard when placed on the floor to date, I am looking for a piece of foam mat or something soft to place under the mat so that my baby can use it. 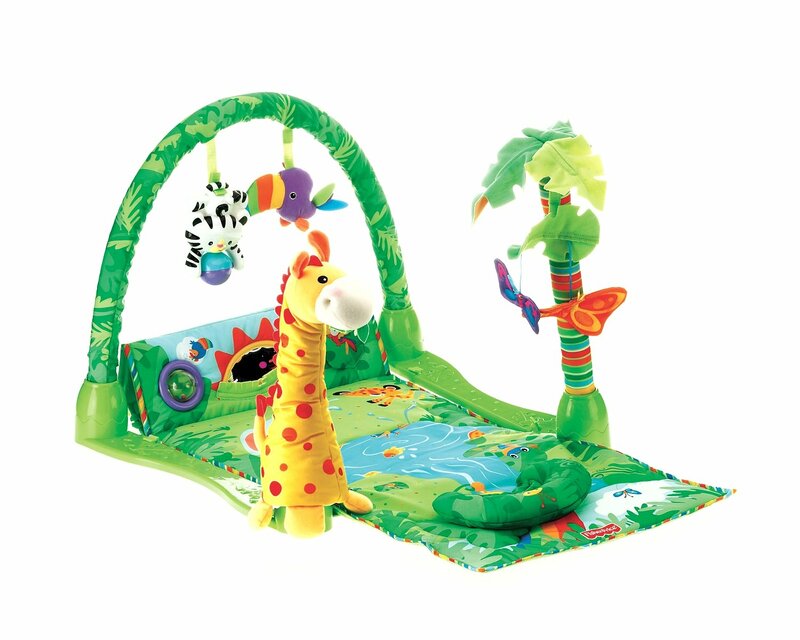 The colors are vibrant and the toys seem durable. 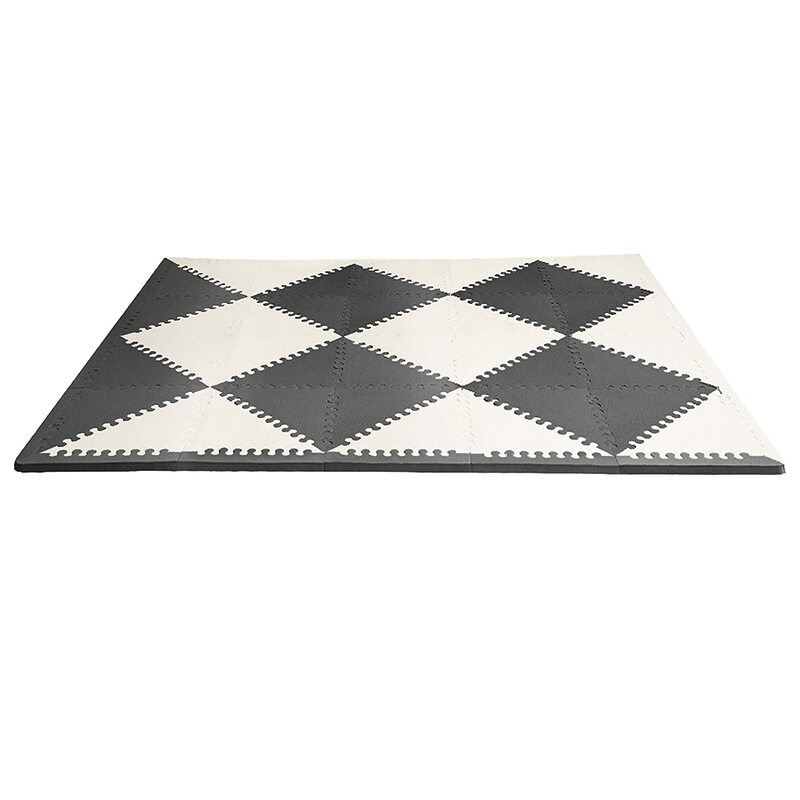 The mat is easy to assemble and does not take up too much space. 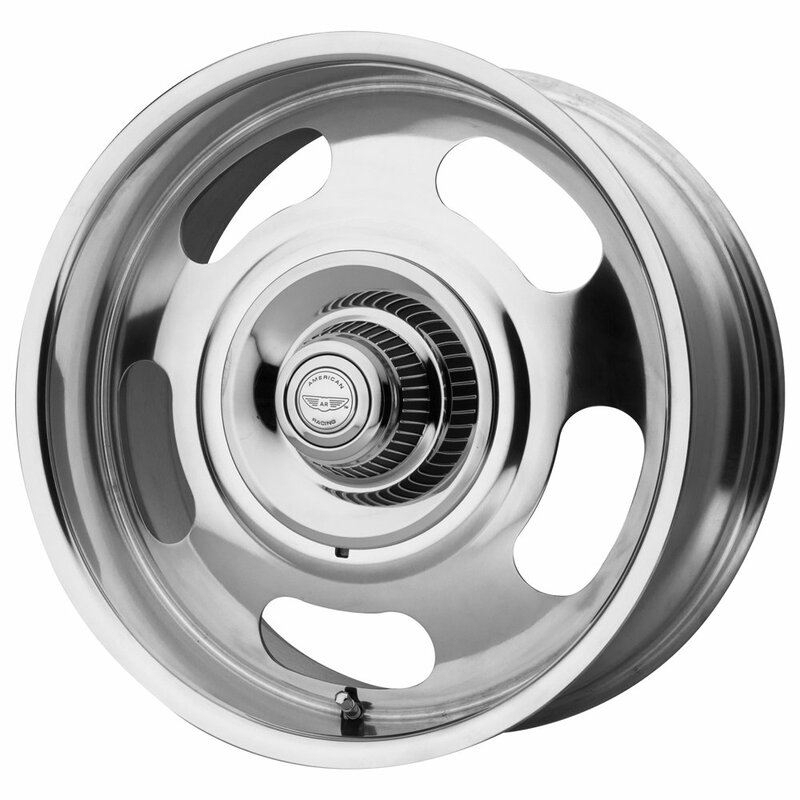 Been using it since our little one was 3 months old. He loves it! 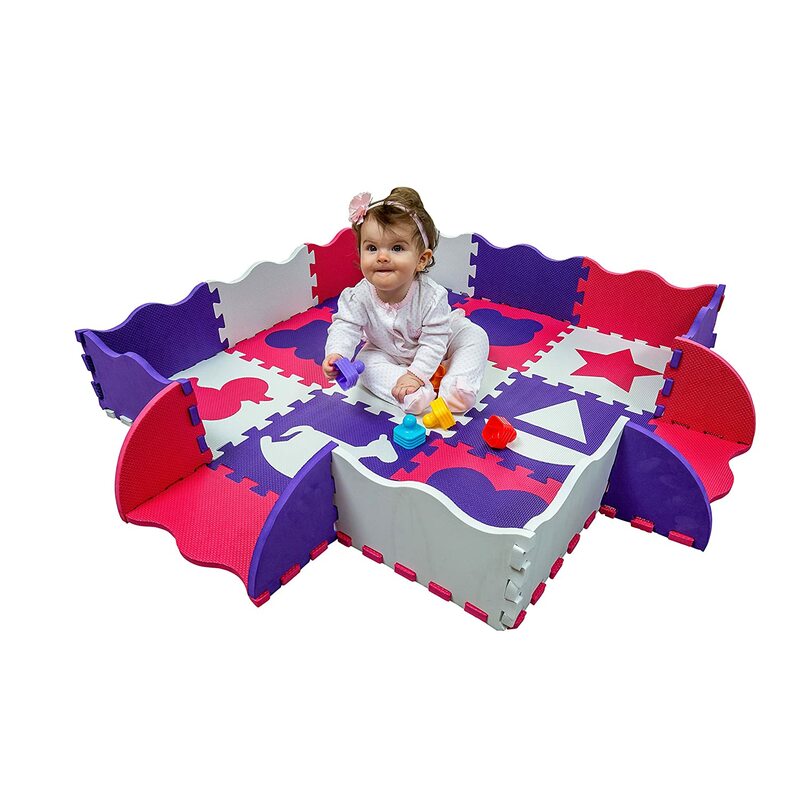 The star plays music and can be velcroed to different parts of the gym or used alone. The clips are interchangeable and you can switch the toys around or add your own. 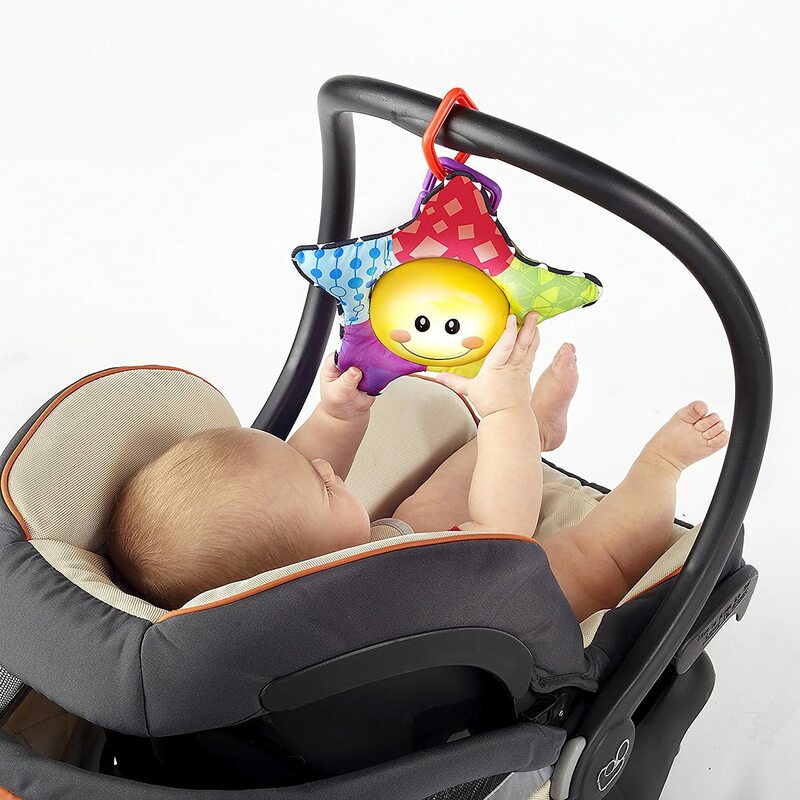 We've also taken some of the toys with us in the car and attached them to the car seat for entertaining the baby on trips and at the doctor's. Highly recommended.